On the hunt for weapons and to take down any Savior no questions asked, the communities came together against the Sanctuary. But everything didn't go as planned. The Kingdom came across an unexpected weapon cutting King Ezekiel's unbreakable optimism down to size, while The Hilltop Colony deals with unsuspecting visitors. It's time for another recap of The Walking Dead's latest episode! The fourth episode of this season changed Some Guy its tune than the previous three episodes by focusing on one central storyline and group. 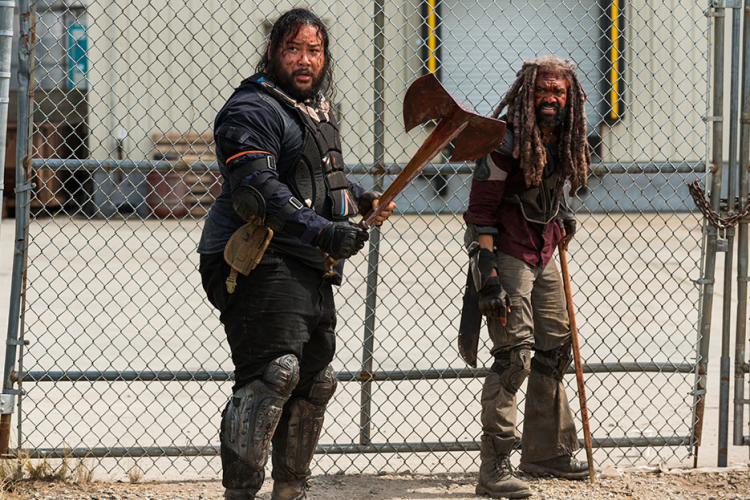 The near closing moments of Monsters saw King Ezekiel's vibrant optimism shot down by a concealed weapon and assailant in the Sanctuary compound. His soldiers all scattered, some hit with bullets along the way, a few who tried to shield their leader. Some Guy had a bit of a story to tell: the falling of a King. We've lost a lot of people along the way in this zombie apocalypse. Saying or knowing that the way this battle is going to end is not the same way it would've began doesn't seem to be enough when we see the characters face tremendous suffering. Even with the gumption of three communities banding together to knock Negan out, there was still going to be plenty of red shirts to suffer the consequences. Ezekiel opened the episode getting ready for the morning of the big war, shaving and tying his hair (putting on his costume so to speak), before everyone headed off to the Sanctuary. Before pulling off into the distance, his community (excluding Carol) swarmed the king in uniting that they were one after one more final speech of unity and presumed victory. What a contrast it was to see in the present moment Ezekiel pulling himself out of pile of his killed followers who had been shot down. In nearly every direction, dozens of his friends had spilled their blood and guts - literally. It didn't take long for them to reanimate into walkers and come after Ezekiel who was also injured. When Ezekiel getting chased down by his deceased friends, a lone Savior looking like Dwight Shrute's cousin from The Office, began hounded him. Negan's plan was to keep Maggie, Rick, and Ezekiel alive to be walkers on display at the Sanctuary, but this guy just seemed to have a trigger finger. Just when it seemed like Ezekiel was going to be killed anyways by Savior with a trigger finger, Jerry came and spliced him open. Thank heavens the King has such a cool dude on his side. Paralleling a moment from East where she was blocked by Saviors on the road and shot them all with a gun literally up her sleeve, Carol tried to make the surviving Saviors give up the remaining guns. Instead she had to morally choose between the guns or going to help Ezekiel and Jerry who were getting attacked by walkers. Initially, when they thought the Saviors would get away with their small armory before they heard Daryl's motorcycle in the distance. YEAH, they weren't getting too far. Together, the trio made it back to the Kingdom. But it was not an easy trek by any means. They were swarmed by walkers again and again. At one point, they came across walkers stuck in sewage. By facing the loss of his loyal troupe, Ezekiel faced an identity crisis that he was not a king; the apocalypse is not the stage his followers had expect him to perform in. The loss of so many weighed on him until the point he was going to sacrifice himself to the walkers to let Carol and Jerry get free. Right in the nick of time, Shiva sacrificed herself to the group of walkers, forcing Ezekiel to face one incredible loss and staple to building up his King persona. Impressively, this one of the few times where two episodes bookended each other without blurring the timeline. The kick-off of the eighth season is not letting up on the action, and this is a favorite so fa confounding character development and supporting it with action. "I ain't no king. I'm just some guy." In all four of the episodes, Ezekiel was set center stage in front of his and the other leaders followers about the hope of the future. A common phrase he used was "and yet I smile,". Even though Khary Payton performance of Ezekiel is the powerful innocence the show needs to add some variation of worn and experienced survivors, his speeches were getting a bit repetitive. Now looking back on them, they were reinstating his optimism and faith for these fatal blows to mean something. An insult from the Dwight Schrute Savior calling Ezekiel 'a meaningless man in a costume' rang even truer in his eyes after witnessing all of his volunteer warriors' deaths. Jerry's still aiming to put his majesty first, despite Ezekiel's declarations and pleas not to, but a big question remains if all of his followers give up on those ideals so quickly. The episodes were marked with various interesting contrasts; Ezekiel leaving the Kingdom, his brothers and sisters raising their arms in a victory declaration, to him returning home only with Carol and Jerry by his sides, bloodied and seemingly defeated. Additionally, Rick and Daryl riding up to a Sanctuary vehicle in Monsters bookended this episode by showing their highway standoff to pursue those guns. Since season seven Carol has seen through the performance Ezekiel gives as a leader. Because of this, she's become a bit of an outsider within the Kingdom, but a well-acclimated one by developing a friendship with him. Just like Monsters, there were notes of her not fully jumping on board with Ezekiel's persona, or at least recognizing the difference between stage and reality, when she didn't join in on his final motivational speech. She had tried to warn him previously that people were going to die no matter how optimistic he wanted to be. When faced with the decision to let her friends die to claim the guns, she chose her to save her friends instead (as she has always done and will always do). However, it'll be interesting if her relationship with Ezekiel changes any, and which avenue she'll encourage him to take as a leader, or if she can become the leader the Kingdom needs right now. All of the action between the Saviors and our communities for Some Guys was exciting and heartbreaking. Ezekiel's grand presence built up by his followers hadn't been shattered thus far, and it was refreshing for an episode to center on some who required a unique way of facing reality and seeing his air of invincibility to keep his community inspired in a different light. The king may have lost his crown. Will he be able to regain the throne again? + Like Andrew, Melissa can do so much with so little. The little look of hope she had when Daryl's motorcycle could be heard in the distance - she knew the guns weren't getting far. + I'd personally love to see Carol have a similar moment from Nebraska with Ezekiel. Rick had told Herschel, "It's not about what we believe anymore - it's about them." + I want every Ezekiel phrase I can get on a t-shirt. He has so many. "Fear not, We will be brave because you are brave." + "Was it easier for you - have you always been this way? this strong, this brave? or did you decide to be who you are today? - "I decided just like you. Life decided some things too." + It's startling and saddening how well Carol has acclimated into the Kingdom. There was never an official send-off for her away from Alexandria and her original family. Everyone just accepted that she left without really leaving, and is safe and sound. Maybe that's all Team Family needs? + Rick told Daryl, "Let's go see if he's still alive." Seems like Rick is starting to consider more what to do with the Saviors, or at least ask questions, kill them later - which is not Daryl's approach at all.